The Little-known Stretch of the French Riviera. Although southern France comes with a medieval legacy of troubadour poets, I never expected to see a poetry shop. But there’s one in the harbor town of Cassis. Framed and written on marbled paper, there are over 4,000 poems on love, life and friendship to choose from. Dominated by a fortress castle and with a back garden of vineyards, Cassis is the unhyped Riviera—a leftover from a time before concrete, traffic jams and wastrels who blow thousands of dollars spraying champagne. A few miles east of Marseille, this unsung stretch of the Cote d’Azur ignores the vapid celebrity culture of St. Tropez and Cannes. Most visitors are French. Ringed by a half moon of terraced restaurants and houses painted in Provencal pastels, its small harbor is crowded with multi-colored fishing smacks whose origins go back millenia. Known as pointus, the boats have unusually high bow posts. I swear I’m not making this up, but it’s said they were designed by the ancients as a phallic symbol. Cassis is one of the few spots left along the Mediterranean where such boats are still used. Be at the waterfront in the early morning when the catch is landed, and you’ll see what’s likely to be on lunchtime’s platters of fruits de mer. After a feast of clams and langoustines washed down with a bottle of dry Cassis white, you may even want to write a poem praising the fertility gods of the sea! Sharing the harbor, pleasure craft take visitors out to the spectacularly scenic calanques. Arrowing through towering white cliffs between Cassis and the outskirts of Marseille, these skinny canyons of secret coves and turquoise water are often called the Mediterranean’s fjords. Rock climbers tackle the crags and needles, and there are also hikes of various length and difficulty levels. The nearest calanque to Cassis is around a 40-minute walk, but the entire trail takes around 11 hours. If your idea of bliss is lazing on a beach, you won’t have to suffer the usual Riviera torture of rocks and pebbles. Unlike around Nice and Cagnes-sur-Mer, Cassis has several beaches of shingle-sand. Plage Grand Mer is popular, and early April was warm enough for soaking up the rays. A little further on, Plage du Bestouan is clothing optional. And they’re public beaches—many people don’t realize that the inviting-looking Pampelonne beach at Saint-Tropez is mostly shared by private beach clubs that charge substantial amounts. At the famous Club 55, two sun-loungers and an umbrella will run you from 50 euro to 100 euro a day, depending on time of year and proximity to the water’s edge. 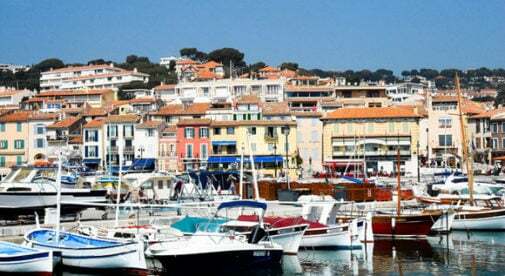 Cassis is sometimes called “the poor man’s Saint-Tropez,” but poor is relative in this part of the world. The least expensive property I could see was a 25-square-meter studio apartment priced at 150,000 euro ($187,000). In a modern residence with views of Cap Canaille and the sea, it’s in les hauteurs (the heights) above the harbor. Near the waterfront, something of a similar size was 160,000 euro ($200,000). For a Cassis village house (117 square meters), think 430,000 euro ($536,000) plus. But compared to Saint-Tropez, some might call that a bargain. There, even smaller maisons fetch over 700,000 euro ($872,000). But go inland and prices drop dramatically. Four miles from Cassis, Carnoux-en-Provence is a purpose-built town where buyers get far more living space for their money: 130,000 euro ($162,000) buys a 55-square-meter apartment. Although Carnoux isn’t the Provence of the imagination, not everyone wants an old-style village property. But if you do, they’re out there in some secret corners for under 200,000 euro ($250,000).